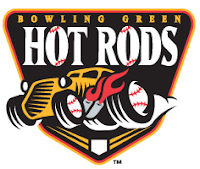 Bowling Green, KY - Alexander Colome wrapped up a middling month of June with one of his finest efforts of the season, leading the Hot Rods to a 2-0 shutout victory over the Lansing Lugnuts (4-2, 40-35) on Wednesday night. The win for Bowling Green (35-40) wraps up their second straight series victory to begin the season half of the season, moving them to 4-2 in the Eastern Division. It wasn't all roses for Colome to begin the game as Lansing nearly got to him in the first inning. With two outs, Kevin Nolan singled into right field with Justin Wilson at second base. Wilson tried to score but was thrown out at home plate by Brett Nommensen to end the inning. From there, Colome took charge. He worked back-to-back perfect frames in the second and third before putting the first two runners on in the fourth. The brief jam didn't bother Colome as he retired Nolan on a fly to right field before striking out the final two batters to end the inning. While Colome was cruising, the Hot Rods put together a two-out rally in the bottom of the second. Tomas Francisco began the attack by getting hit by a 1-2 pitch from starter Dave Sever. Julio Cedeno followed with a double into the left field corner to put runners at second and third for Robi Estrada. The Hot Rods shortstop would come through by hooking a double into right field to give the Hot Rods a 2-0 lead. Colome made the lead stand up with perfect frames in the fifth and the sixth. He pitched into the seventh, allowing the first two guys to reach. He settled down to strikeout Balbino Fuenmayor for the first out before picking off Nolan at second base for the second out. He nearly got out of the inning by himself when his 3-2 fastball to Justin Jackson just missed the zone for a walk. That brought on Jake Sullivan, who promptly struck out Eric Eiland to end the inning. Colome ended up working 6.2 shutout innings, allowing just four hits. He struck out six, his highest total of the month, while walking three. He earned the win, his fifth of the season and his only win in the month of June. Jake Sullivan worked another inning after his bail-out job in the seventh, retiring the side in order in the eighth. Scott Shuman came on and earned his 11th save of the season to finish out the ninth. Estrada's double was one of just four hits for the Hot Rods on the night against Sever and relief pitcher Aaron Loup. Gabe Cohen added a single while Cedeno finished with a pair of hits to go 2-for-3. The Hot Rods third baseman has hit safely in four of five starts to begin the second half. The Hot Rods now open a three-game series with the Fort Wayne TinCaps (San Diego Padres) on a Thirsty Thursday presented by All Hit WUHU 107 and Beaver 96.7 FM. The pitching match-up features LHP Kyle Lobstein (5-3, 3.95) going up against Fort Wayne LHP Jose De Paula (3-2, 1.95). First pitch is at 7:05 PM. For tickets, visit www.bghotrods.com, call 270.901.2121, or head to the Ticket Office at Bowling Green Ballpark.